A Siren’s Song Environmentalist Kristianne Newhart is a rescue worker with a special love for creatures of the sea. Yet when she saves the life of gorgeous merman Gerard, her affection and respect spark to a red hot desire that blazes hot in the tropical sun.... A merman with a special talent for pleasing and healing women with his magical touch, masseur Gerard aims to take special care of his brave, funny rescuer Kristianne; yet when his gratitude turns to desire, can he woo her with his siren's touch? 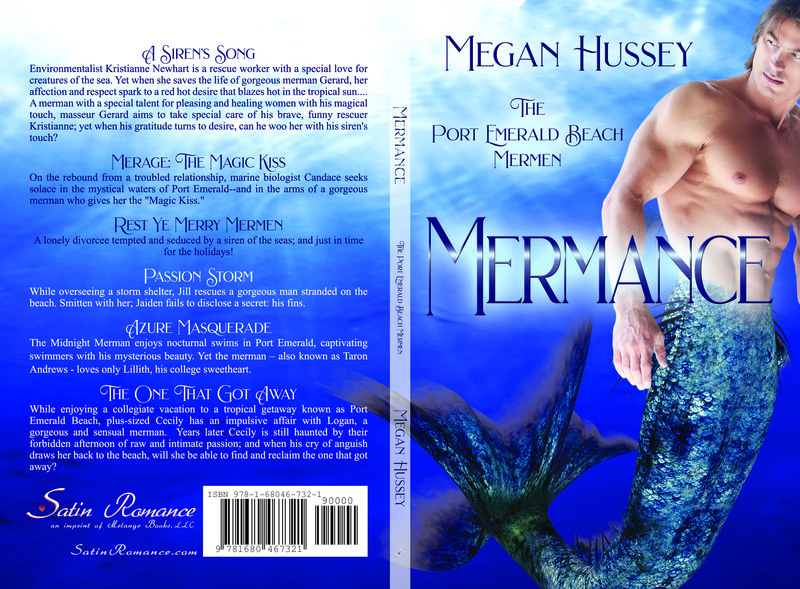 Merage: The Magic Kiss On the rebound from a troubled relationship, marine biologist Candace seeks solace in the mystical waters of Port Emerald--and in the arms of a gorgeous merman who gives her the "Magic Kiss." Rest Ye Merry Mermen A lonely divorcee tempted and seduced by a siren of the seas; and just in time for the holidays! Passion Storm While overseeing a storm shelter, Jill rescues a gorgeous man stranded on the beach. Smitten with her; Jaiden fails to disclose a secret: his fins. Azure Masquerade The Midnight Merman enjoys nocturnal swims in Port Emerald, captivating swimmers with his mysterious beauty. Yet the merman – also known as Taron Andrews - loves only Lillith, his college sweetheart. The One That Got Away While enjoying a collegiate vacation to a tropical getaway known as Port Emerald Beach, plus-sized Cecily has an impulsive affair with Logan, a gorgeous and sensual merman. Years later Cecily is still haunted by their forbidden afternoon of raw and intimate passion; and when his cry of anguish draws her back to the beach, will she be able to find and reclaim the one that got away?